US, 1941, 101 minutes, Black and white. MGM. Mickey Rooney, Lewis Stone, Fay Holden, Celia Parker, Sara Haden, Kathryn Grayson, Ian Hunter, Ann Rutherford. 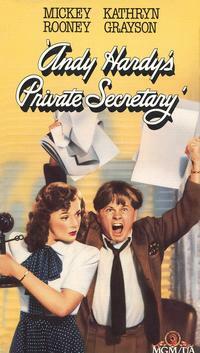 Andy Hardy's Private Secretary brings Andy Hardy's career to the end of high school and his graduation. The film also introduces Kathryn Grayson to the screen and she has the opportunity to sing from Strauss, Donizetti's Lucia di Lammermoor as well as Cole Porter. Ian Hunter appears as their father. The regulars all appear to the usual advantage although Andy Hardy's sister Marion is missing from this film. The film gives its attention to Andy Hardy at school the preparation for the graduation, his preparation of the celebrations and his being on committees,. He also writes a Greek tragedy and rehearses it. In his busyness he gets the help of fellow schoolmate, Kathryn, played by Kathryn Grayson. Her brother Harry is jealous of Andy. There are various difficulties including Andy's intercepting a telegram and delaying the departure of Kathryn's family to South America, thus causing great hardship and stern rebuke from his father. He also has a scene where he tries to buy stockings but is self-conscious. He fails his English exam, gets the chance to do it again after confessing this to his parents and is helped by Polly Benedict, Kathryn and Harry. The finale is, of course, a success. Ann Rutherford continues her role as Polly Benedict. Kathryn Grayson has a good opportunity to be introduced as a telling screen personality and singer. Ian Hunter is the sympathetic father. Judge Hardy seems to take a severer tone in this film when talking with Andy and trying to make him see his poor judgments and lack of responsibility., However, his mother is still old-fashioned and helpful. One of the ironies is that it is his Aunt Milly who is the English teacher and has to fail him in his exam. Needless to say, Andy Hardy graduates and is able to move to the next film Begins for Andy Hardy.